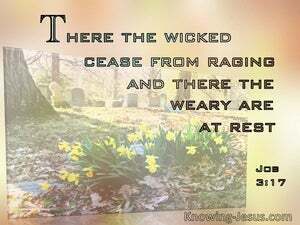 ﻿ Job 3:17 "There the wicked cease from raging, And there the weary are at rest. There the wicked cease to make trouble, and there the weary find rest. In that place, the wicked stop causing trouble, and there, those whose strength is exhausted are at rest. There the wicked cease from troubling; And there the weary are at rest. 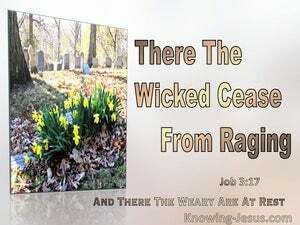 There [in death] the wicked cease from troubling, and there the weary are at rest. There the passions of the evil are over, and those whose strength has come to an end have rest. There the unjust ceased to be angry, and the weary in strength shall rest. There, must the wicked cease from their tyranny, there such as are overlaboured be at rest. 16 "Or like a miscarriage which is discarded, I would not be, As infants that never saw light. 17 "There the wicked cease from raging, And there the weary are at rest. 18 "The prisoners are at ease together; They do not hear the voice of the taskmaster.